Police want to speak to these two men in connection with the fraud investigation. POLICE hunting fraudsters who stole thousands of pounds from a Bradford man in a fake 'gems' scam have released a CCTV image of two men they want to speak to. 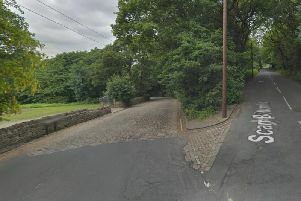 Detectives said the fraud started on March 25 when a black man approached the 45-year-old victim in the BD7 area and offered to buy his Nissan Qashqai car. The victim exchanged details with the man and agreed to meet him at a business park in Canal Road on March 29. The victim agreed to buy the items for a discounted price and thousands of pounds were handed over. The gems, which were referred to as 'Blue Gold' have been found to be fake and police are now warning the public to be aware of this scam. Police Constbale Toni Hinnells, of Bradford District CID, said: "While we are only aware of one report of this type of fraud so far this year, we are aware that a similar scam has previously operated in the Bradford and Huddersfield areas. "It is possible that these men are part of a larger group, who are targeting individuals to gain significant amounts of cash through deception. "We want people to be fully aware of the potential tactics being used by these criminal enterprises and to report those behind it. "If it appears too good to be true, it is most likely that it is." Anyone who has information about this incident or who can identify these men is asked to contact Bradford District CID, quoting crime reference 13170144170.